Story of a guy who retired at 50, and is beginning the second half of life. A guy finding out if life really does begin at 50. Let me start by saying that my Automatic App + Adapter is an Okay (air quote type of Okay) device. It has potential - assuming they update it, or their '3RD PARTY APPS' get Android versions. Right now, the 3rd party apps I'd be interested in using are IOS only. As you probably know, I'm an Android phone kindof guy. The best thing about Automatic is that it is automatic. The worst thing about Automatic is that it is too automatic. You have zero control other than you get to assign your car a nickname - and in fact, that is totally optional. 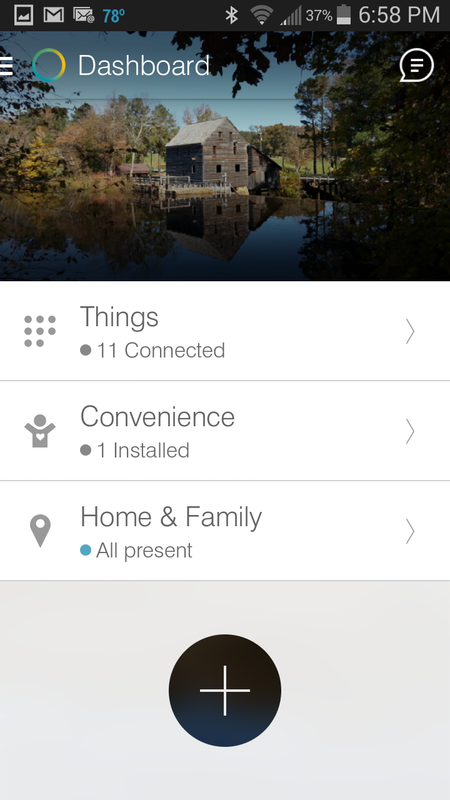 The install and set up was painless - install the app first and follow the directions. One neat thing was it used the phone's camera to read the VIN barcode (through the windshield - impressive). Had that not worked, I would have had to type in that long string of characters. So I was very pleased that the bar code scan worked on one hand, but actually a little ticked that the reason they want the VIN is so that they can lock the adapter to a single car. They want you to buy another adapter for each car. They only need the VIN to fulfill their greed. The adapter plugs into the OBD2 port, which on my vehicle is easy to access, took seconds to do, and would be a snap for me to remove and take it to a 2nd car. But NOOOOOO - not allowed! I would not buy this gadget again for that sole reason. I have 2 cars. Granted it would be less than ideal to swap cars, but less than ideal or $99 out of pocket for a 2nd car... Exactly. However, it updated the firmware on the device after the app connected to the adapter. Good. Expected. Yawn. Now for actually using it. 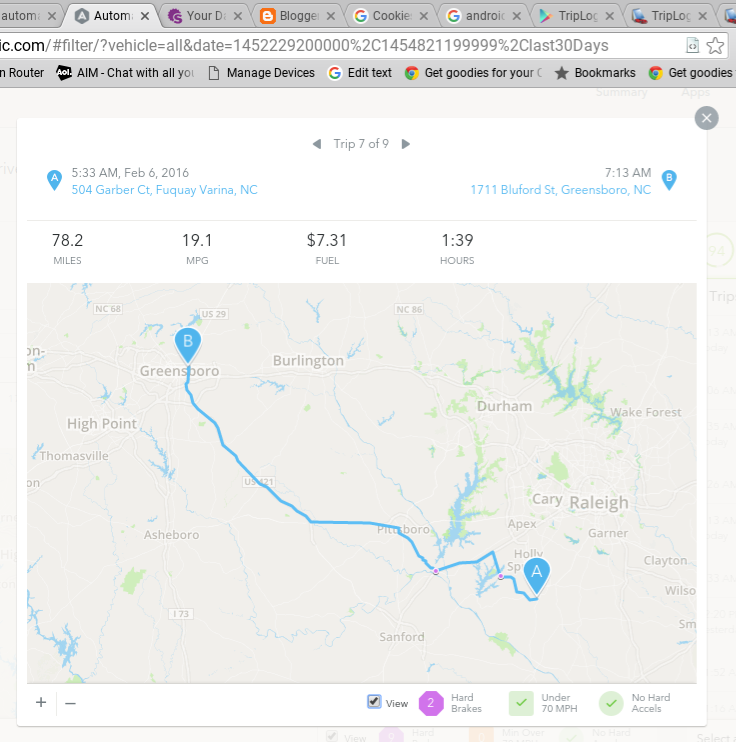 Automatic does a really nice job of automatically logging your trip. You just start your car and go. You don't have to mess with the phone at all. A few seconds after you start your car, you hear a chirp to let you know Automatic is connected and active. You turn off the car, and it stops. All of that is 'automatic' which I guess is why they choose that name. For sure, that saves you the old school frustration caused by forgetting to write the mileage (and start time) down at the start of a trip. Since it logs every start/stop of the car with no effort on your part, you'll have a trip to review if you desire. Using the phone app, you can easily answer the typical questions like - What time did we leave to go to the doctor last week? When did we get home? How far was it to xyz? All those questions are a snap to answer by scrolling through the trip displays on the app. 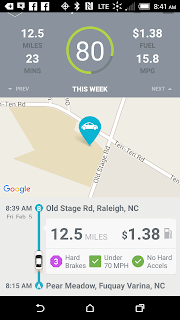 Besides the trip data, you get the gas used, MPG, and how much the trip cost you. It draws you a map of your route. You can zoom in on the map. All that is way cool. But.... NONE of that trip information can be changed. If you want to split a trip (stop your current trip and start a new trip), you can't do that unless you cut the car off and wait 15 minutes for it to decide it's not a "brief" stop. Then it closes that trip out, and when you start the car, it starts a new trip. The 15 minute 'window' to combine 'brief pauses' is handy when you stop along the route and buy gas for instance. But if you stop en route to do some shopping for 15 minutes, that stops the trip so that you can't get a round trip view. So the app needs either a 'Completed trip' or 'Join trips' button. You can't even tell it how much the price of gas is/was so it can calculate the correct cost per mile. 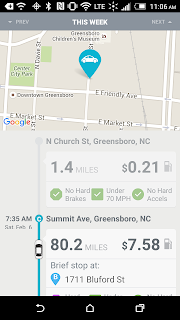 The website says it uses gas prices near your trips GPS location to estimate the cost of fuel. That bit of information was posted 3 years ago with a quip that they'll look into manual entry. So don't expect that feature - but I'd say their 'ball park' guess at the gas price is good enough - It's just the new high-tech $99 method is less accurate than the free old school method of taking a picture of the gas receipt. The app gives you a running 'score' (0 to 100) based on your driving behavior. It deducts points from your score if you accelerate too fast, decelerate too quick, or drive over 70 mph. 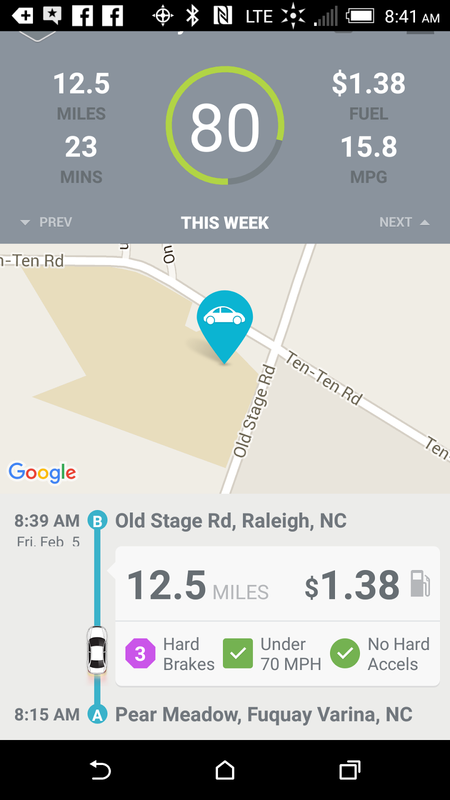 Improving your score and improving your gas mileage should, in theory, go hand-in-hand. It even ranks you. "Your score of 94 places you in the bottom 49% ..." Yet another reminder that I'm not in the top 1%. It's very sensitive to braking. It beeps every time it deducts points. The feedback can be turned off. Good! Another major issue I have with Automatic is that it won't show me any of the car parameters (like rpm, gas tank level) etc. I had a $29.95 Chinese (wired) car monitor that would tell you everything - what your oxygen sensor reading was - your spark timing, etc. I like to be able to drill down and see that information, but the Automatic app will not do that. I read on the Automatic website that there are two OBD reader apps that will, but they are IOS only. I'm Android, so I'm out of luck. Based on the slow roll out of new features in the app, I would not expect 3rd party IOS developers to be quick to support Android. Why? For $23 you can get an OBD2 Bluetooth reader that gives you all OBD2 data your heart desires. I don't see IOS developers wasting time to develop an Android app for a $99 device when there is a $23 (free shipping for Prime customer) solution available now. So, speaking of other solutions. 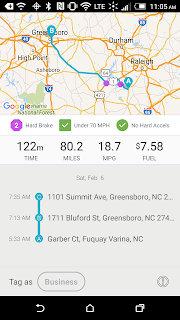 I checked the Google Play Store, and I see an Android app (TripLog by BizLog) that for free does what Automatic does for a single trip at a time. For $15 a year, it saves an unlimited number of trips - and best of all, since it's uses only your phone, it works in any number of vehicles. So, I'd recommend that you go give that a try. 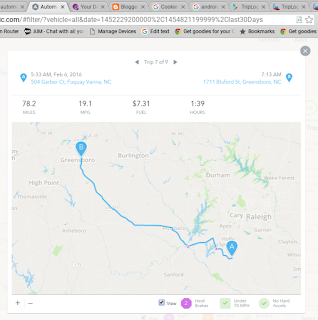 A trip that I made from home to Greensboro. Yes, really, I left at 5:33 am. I got to Greensboro at 7:13 am which I considered the end of my trip since that's where I unloaded Maryann and Johnny at a NC FIRST Lego League state competition. But since I only stopped there for a couple minutes, Automatic considers my trip ended at McDonald's where I stopped for coffee and to read my paper. You can't stop, start, or restart a trip with one click which to me is a MAJOR fault. 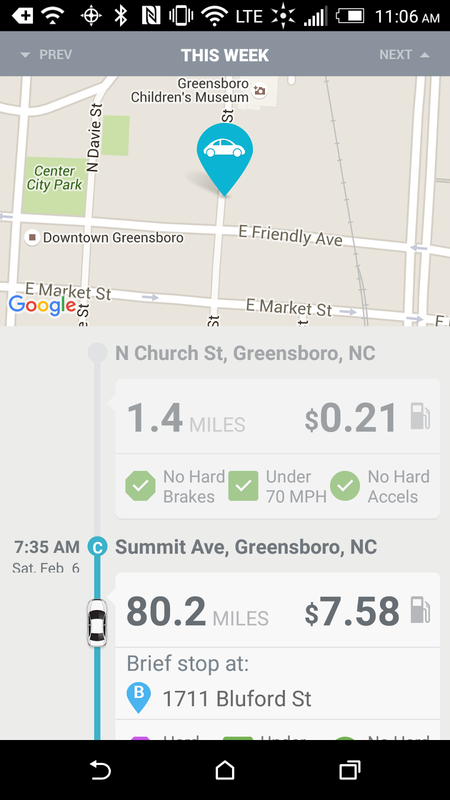 Automatic does help you find your car if you lose it (and I assume if someone 'borrows' it). It will also text 3 people if it detects you are in a crash which is a plus. My running score of 80 (from yesterday when I took my very first trip using Automatic). 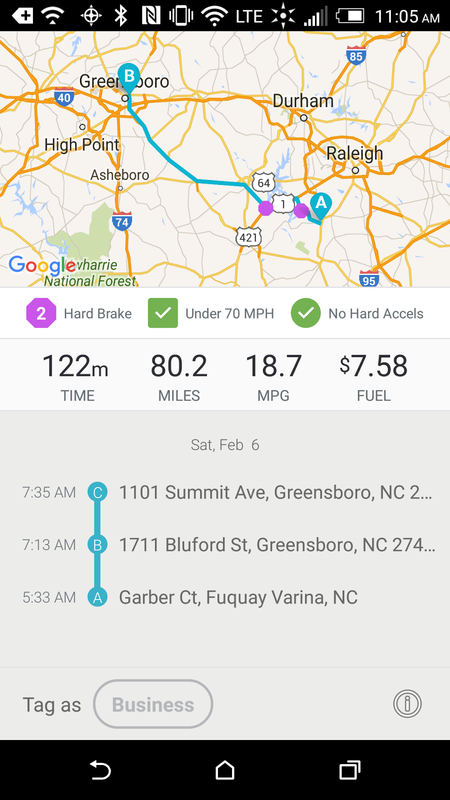 Automatic will fulfill your needs for a very simple car trip logger, but if you're looking for something more sophisticated, look someplace else! I've lived in my home for 25 years, and I've often had issues with damp musty odors in my MBR closet and in the front bedroom. The problem is worse in the spring and fall when the outdoor air temperature is less than 80F because the AC does not run enough to dry the indoor air. Typically on hot summer days, the AC runs enough that the indoor relative humidity (RH) will be about 55% or less. On the cooler days, the indoor RH can be over 60%. 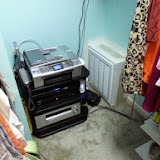 The 2nd air return I put in the MBR closet helped, but when we had a few warm days with dew points in the upper 60s, Maryann said she started noticing a musty smell in the corner of the bedroom. I set up the portable dehumidifier, and that took care of the issue. However, having to listen to it run and to dump the water one or more times a day, got old fast. I decided to bite the bullet and install a whole house dehumidifier. Whole house dehumidifiers are no different than portable dehumidifiers except on how they are packaged. Whole house dehumidifiers have collars that allow them to be connected to ducts, and they require piping to a drain to handle the water removed from the air instead of using some type of catch bucket. Some whole house dehumidifiers require an external dehumidistat to control them. Others have an internal dehumidistat (again just like a portable dehumidifier). They all have an internal fan to move the air over the coils, and that fan works with the existing HVAC system fan. Some of the larger whole house dehumidifiers also allow outside air to be drawn into them which is important in air tight homes. My house is not air tight, so being able to draw in outside air was not necessary. In fact, since the outdoor air in North Carolina can be very humid, it would add to the indoor humidity. My house being 'loose' is one of the reasons my indoor humidity is high to start with. I've not measured, but I'm sure I get several air exchanges per hour without even trying to add outdoor air on purpose. The number of air exchanges per hour will limit how low you can reduce your indoor humidity on humid days. I searched and found several units based on the size of my existing AC unit (2 tons) and my home's square footage that would work. I decided on the TrueDRY DR65 by Honeywell. It can remove 65 pints (8+ gallons) of water per day and is Energy Star certified and removes 2.22 liters (4.7 pints) per kilowatt hour (KWH) of energy. It also had the advantage of a low height so that I could simply sit it on top of my existing air handler. That installation is simpler since it allows easy access to the return and supply plenums as well as the existing condensation drain. I had to run a new 120v circuit and install an outlet near the DR65. I choose to use the internal dehumidistat (I set it to 45% RH). I did install the backdraft damper which was recommended for the configuration I chose, Main Return to Main Supply, which puts the DR65 in parallel with the existing air handler. This configuration requires the air handler fan to run anytime the DR65 operates. This was simple to achieve using the sample wiring diagram provided which inserts the DR65 into the fan circuit. 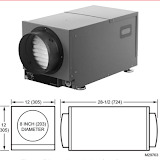 The demumidstat for the DR65 or the HVAC thermostat can turn on the system fan when needed. The backdraft damper is needed only when the system fan is on and the DR65 is not running. On most days it cycles on and off as needed. The AC may run more often since the DR65 does add heat to the air as it is dehumidified and I didn't include that cost in my calculations. In theory, I could raise the indoor temperature a few degrees since dryer air feels cooler, but as of yet, I still have my thermostat set the same as before the DR65 (76F). So as of now, I'm happy with my decision to purchase and install the DR65. It has a 5 year warranty. so I'm looking forward to many years of service from it. The only maintenance required is to replace the MERV 11 filter once a year. We've had pretty good luck with the a Bluebird box in our yard. We get two and sometimes three broods a year. We've also seen barred owls in the yard, so Maryann decided we should try to see if we can get the owls to nest by putting up a box. She found box plans, so I got busy. You can click the image to see the album with the blow by blow. I pretty much followed the web page instructions, and construction was straight forward. Only thing extra I did was use my biscuit joiner to join the sides and bottom. Constructions took about 6 hours spread over 3 days. I cut the wood the 1st day, stained it the next day, then assembled it the following day. I had to wait for a day or two for nicer weather to install it in the tree, and the install took about 3 hours. I had the wood, but the stain, fasteners, wire rope, clamps, etc. cost about $45. You can skip the stain and use chain to hold the box to the tree if you want. You can read Maryann's Hoots up There? 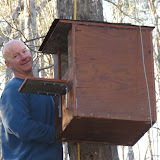 Building a Barred Owl Box blog post on GeekMom. She did a great job documenting, and there's even a video! I've been a Dish satellite customer for 10 years now. Over the years, Dish has battled with the local station owners over rebroadcast fees (the fee cable and satellite companies have to pay station owners to rebroadcast or carry the local channels for customers of the cable or satellite company). In September 2013, NBC and Dish had a dispute over the fees, and as a result, programming provided by NBC was not available on Dish for a month or so. At that time, I purchased an OTA (Over the Air) adapter for my Dish Network 722 VIP DVR/Receiver. I used a home made dipole antenna, and it worked well. I was able to get NBC and several other local channels, but since the antenna was directional, I could not get both NBC and PBS at the same time. In time Dish and the local station settled, and NBC programming was once again available on Dish Network. Then this November, I was watching the the local news and saw a segment on a local Raleigh company named Mohu which makes antennas. I ordered a Leaf® 50 HDTV Antenna, and it arrived in a few days. The packaged included the flat antenna, an amplifier with power module, and a 16ft coax. The instructions suggested placing it near a window which in my case was not possible. My equipment is in the middle of my house, so I decided to put the antenna in the attic, but the 16ft of coax included was not long enough. I checked the Mohu web site, and they said the coax could be up to 25 ft long, so measured and cut a 25ft piece of coax. The extra 9ft was just enough to reach the nearest outside wall in the attic. I ran the coax inside of a partition wall from the attic to the equipment. I had just enough cable to extend about 2 feet from the wall. I hooked the coax from the antenna directly to the OTA adapter without the amplifier to see how well that would work. I scanned the channels, and it picked up 13+ channels. I was impressed with just how well the antenna alone worked. I then put the coax from the antenna into the included amplifier, and powered the amplifier using an available USB port on the DVR. I connected the output lead from the amplifier to the OTA adapter and scanned the channels again. This time, it added 25 channels. I believe that is all the channels in my area! For the last two weeks, I've been using the OTA since Dish Network has removed FOX and CBS due to yet another dispute over rebroadcast fees. It has worked very well. I can record FOX and CBS programming received OTA using my DVR, and watch it when I'm ready. I see why people are cutting the cord. Between what we can get over then internet and what I can get using an antenna it has me thinking about it. I'm not in a position right now to 'cut the cord', but that could change. I were to do it, my Leaf antenna working so well would be a big factor in that decision. In October 2013, I replaced my 25 year old heat pump with a new Rheem Prestige Heat Pump. It is a two stage heat pump with an ECM variable speed blower. During the summer, we left the unit's fan on so that the blower ran continuously (it sped up and slowed down as needed, but never stopped). I had hoped that would solve a damp condition in the master bedroom closet, but it didn't. I had removed the door to the closet and left a small fan on in the closet, but that didn't completely solve the dampness problem either. So the next thing I decided to try is to install an air return in the back of the closet. That will do two things. One it will make it easier for the blower since there will be less restriction in the return, and two the air will turn over in the closet whenever the blower runs. This album Closet Air Return documents the construction and installation of that additional air return. I got the 12" collars, 12" R-6 insulated duct, and the 16" x 16" return grille with filter at my local home center along with the other supplies (mastic, plastic duct clamps, etc). I had drywall supplies on hand as well as foam board. I did the project in several phases spread out over a month. Two of phases, framing and dry walling the return box and then installing the metal return grille with filter, required me to remove the equipment and clothes from the closet. The rest of the work of making a transition box and running the duct I did with the clothes and equipment in place. The only part of the project I left unfinished was sanding and painting the the drywall. I decided I didn't want to deal with the dust. No one is likely to see this unfinished bit. If I get 2-3 days when no one but me is here, I'll finish it. If that doesn't happen, then I'll sand and paint it when I sell the house. I won't know until next summer if this helps with the dampness. I've already noticed that the door to the master bedroom opens and closes easier now that the pressure differential is not as great between the den and master bedroom. 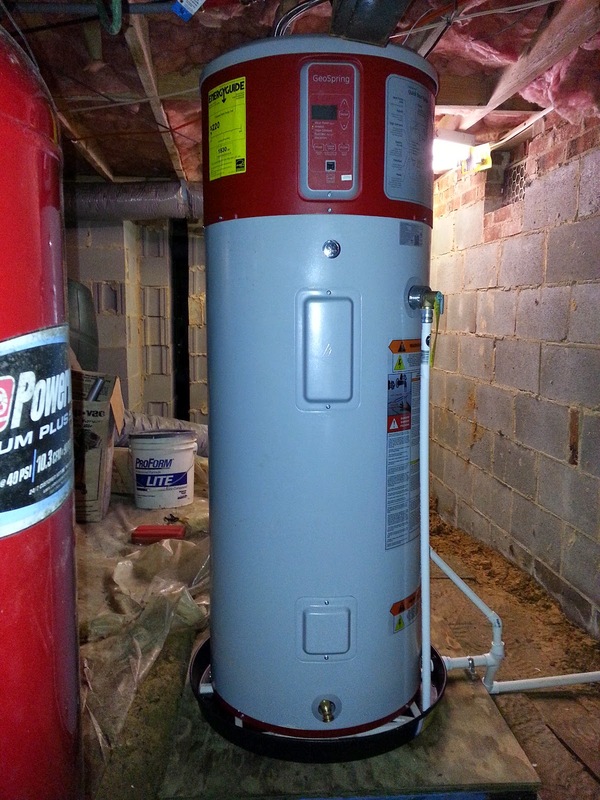 Our new GE GeoSpring Hybrid Heat Pump Water Heater has been installed and operating since 1pm on October 2, 2014. I've had an energy monitor measuring the kWh the GeoSpring has used since it was first installed and turned on. That same energy monitor was installed on the old water heater that the GeoSpring replaced, so I am able to compare the energy used by the two water heaters. I have been resetting the energy monitor the 1st day of each month since March of this year (I installed the energy monitor in February). The old electric 'storage tank' water heater energy is shown in the chart below for the months March through September. The new GeoSpring energy starts in October. The drop in energy usage for October is noticeable (138 kWh vs 318 kWh average). At 10.5¢ per kWh, the GeoSpring monthly energy cost was $14.48 vs. $33.41 (average) for the old water heater. The result is a savings of $18.93. The downward trend in April, May, and June I believe is as much due to an increase in the input (ground) water temperature, as any decrease in hot water usage. The ground water temperature is still quite cold in March and warms as the days warm. The increase in hot water usage in July and August then leveling off in September I think is the water heater leaking. The leak was at the top of the tank where the pipes thread into the tank. So all the water that leaked out was heated. 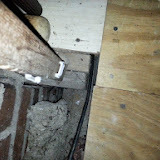 The temperature of the air in the crawl space in October was always above 65 F. In November the crawl space will cool as will the ground water temperature. The heat pump is used to heat water as long as the crawl space is above 45 F. I'm expecting in the latter half of November that the crawl space will be below 45 F, and stay that way until late March. During the cold weather months, the GeoSpring will use the 4500W element to heat the water, so it should perform similar to the old water heater it replaced. I'm very happy with the performance and energy savings of the GeoSpring. Maryann likes always having hot water again. I had a timer on the old water heater, and often when she wanted hot water, there was none. She has noticed that we have used all the hot water the GeoSpring tank holds at least twice, but in both cases, she noticed it during her shower which was right after the two boys had taken theirs. The GeoSpring has a 65 gallon first hour rating, so we adjusted the shower order to hers first and the boys get whatever hot water is left. That may not be much...LOL. Depending on how warm the crawl space stays, the only other adjustment in hot water use timing I plan to make is to run the dishwasher in the afternoon instead of after supper when everyone wants to take showers. That'll make sure the water is as hot as possible when the dishes are washed. 01/01/2015 - Updated the chart with November (178 kWh $18.70) and December (201 kWh $21.18) usage. The crawl space is now 53-55 F on average. The savings is not as great in Nov/Dec because of the decrease in supply (ground) water temperature. I didn't measure the supply water temperature in October, but I'm sure it was considerably warmer than the current January supply water temperature of 51 F. Also there continues to be a high demand in the evenings for showers. The high demand causes mixing of the much colder supply water (in the winter months) which causes the heat element to run longer to heat the ~51 F water to 120 F. After showers the heat element typically runs for an hour to recover which is ~4.5 kWh. Unless we can change our demand pattern the saving (vs standard electric) will not be as great especially in the winter months when the crawl space air and supply water are much colder. I'm considering putting the water heater in heat pump only mode since the crawl space is staying above 45 F. The heat element will not be used to recover which will save energy, but using just the heat pump will greatly increase the time needed to recover. 01/03/014 - Pacific Gas and Electric Company Evaluation of the General Electric Heat Pump Water Heater Demand Response Module states "... heat pump that is approximately equivalent to a 1.5 kW element while using only 0.5 kW of power." (pg 5). 1.5kWh is ~5118 BTUs/hr. It also implies (Fig 9 pg 19) that the electric heating element is activated (and the heat pump disabled) with a 25 F drop in water temperature (if the thermostat is set at 135 F then the heat element will activate at 110 F). I've been doing home automation since the early 80s. I started with an X10 (back when they were called BSR). Back in those early days, the only neat thing I did was turn on lights inside the house (about 4 lamps) when the garage door opened. My Ex actually thanked me for doing that, and it worked well. A few years later, I added controls to close the garage door at 11pm each night (very handy). I followed that with turning the water heater on and off as needed. My water heater is on for less than 30 minutes a day. By doing that, I estimate that I have saved $20 a month for 25 years. That's at least $6000! About 4 years ago, I bought a Vera. Then a couple years ago a, Vera3. Over the life of Vera, I've purchased 3 z-wave light switches, a couple appliance modules, and a of couple security modules. Vera was powerful, and you could program it. It would let you control lights and appliances (any z-wave device) using your smartphone - sort of. If I was at home on my local network, it worked well enough, but if I was away from home, I had to go to a web page to control devices. It worked, but it was not ready for prime time. Vera showed way too much of the complexities, and I found it difficult to use (but it could do almost anything, and if it didn't, you could write your own code). Earlier this month, I bought an Arduino WiFi development board from Spark.io, and that lead me to the SmartThings Maker Kit that includes an Arduino shield. I have watched/listened to a couple of YouTube videos on the "Internet of Things" (IoT) which SmartThings is an implementer of. SmarterThings supports z-wave, ZigBee, and WiFi (such as Hue LED Lights by Phillips). Vera does not support ZigBee, and since I have my eye on a GE GeoSpring Hybrid Water Heater which has an optional Zigbee controller, I decided to get the SmartThings Maker Kit. The kit includes a hub that will allow me to control my existing z-wave devices and experiment with my Arduino kit. I liked the SmartThings from the second I opened the box. It was a snap to unbind my z-wave devices from Vera and pair them with the SmartThings hub. Since Maryann mentioned that Joey needed a key for the house, I decided it was a perfect time to get a z-wave door lock. Johnny and I installed the Schlage Keypad Lock With Lever and paired it to the SmartThing hub in less that 30 minutes. It was so easy to program, that Johnny, who is 10, was able to do it on his own! 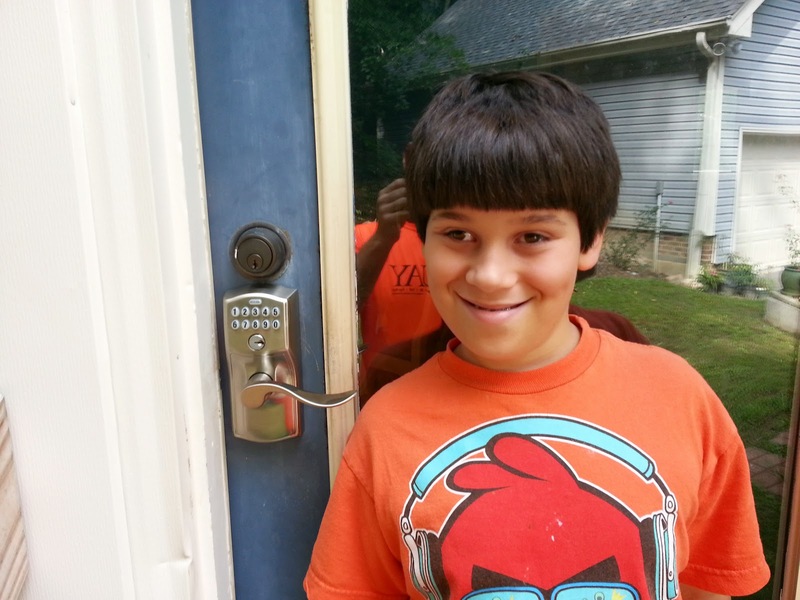 Now, the boys can use the keypad and their own personal number to unlock the door if necessary. We're also implementing the SmartThings Presence Sensor. I'm home when Joey gets home each day, but Maryann is in the van picking up Johnny. Now, instead of asking me, SmartThings will notify her on her cell phone when Joey and his bookbag enter the house. After installing the lock and programming it, I can say that home automation has came a long way since 1982 and the days of the X10.